Westosha Central junior Becca Edwards produced a well-rounded season for the Falcons to achieve a spot on the all-area Southern Lakes Newspapers squad (Earlene Frederick/The Report). OK, I like to use cliches and hyperbole WAY too much, maybe, but isn’t that what local sports is all about? I’m not just trying to open with a joke to catch your attention. But in 2018, the third annual Southern Lakes Newspapers All-Area softball team is bigger and better than ever, and it helps that a local team enjoyed its best season in 30 years and almost won it all, against some stacked odds. The Burlington Demons were seeded seventh, yes, SEVENTH, among eight Division 1 squads in last month’s WIAA softball state tournament at Goodman Diamond on the UW-Madison campus. They ignored the numbers and run-ruled the No. 3 seed before handling the No. 2 seed the next day and advanced to their first state title game in 30 years against Sun Prairie. Though the wheels fell off with three crucial errors in the state title defeat, the Demons finished the season 22-6 and showed the state they are now a serious, dangerous power in the mighty Southern Lakes Conference. When you do rare, exceptional things like almost winning state, you get five players on our All-Area first team, an unprecedented feat. Furthermore, Burlington featured our co-players of the year, Jaina Westphal and Josie Klein, two first team all-state greats. Over the course of the last six weeks, my crack staff of Jason Arndt, Tim Wester, Chris Bennett, Kevin Cunningham, Daniel Schoettler, Dana Ehrmann, Dan Truttschel and Michael Hoey helped gather statistics, nominations, odds and ends and coaches’ comments from our 16 area softball teams, a plethora that includes Racine, Kenosha, Walworth and Waukesha counties, along with five conferences. As always, I have the final say. This idea was my baby back in 2016, when I started questioning why we only did All-Area teams for our four Racine County schools, though it’s the majority of our circulation, at least numbers-wise. We are everywhere, like pools in the summer, and I thought it was only right to show all our newspapers and players some love. This has made for a much more competitive and prestigious squad. My first criterion is always the eye test. What jumps off the page? Stats are a serious consideration, along with impact in the postseason and team leadership. The icing on the cake is what the coach has to say about a player. Is she a team-oriented star that makes everyone else better? Is she one of the best defensive stoppers in decades? It’s our largest first team, and we try our best to represent all 16 teams in some way, shape or form. Sit back, relax, grab a cold beverage, I know it’s steamy outside, and enjoy our third installment of the realest, most hard-hitting All-Area team in southeastern Wisconsin. 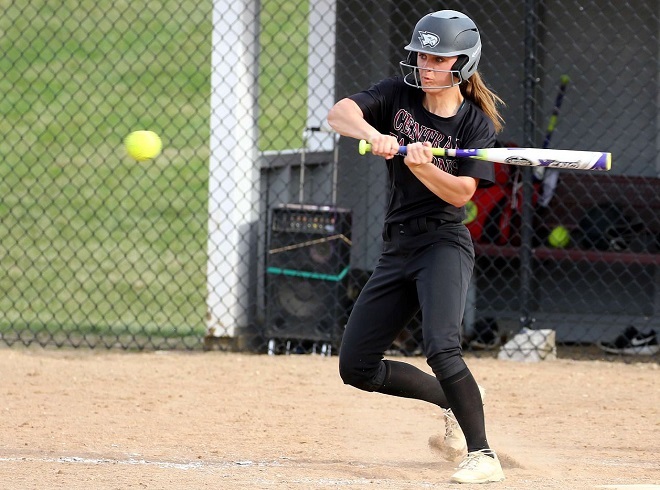 A three-time Metro Classic Conference player of the year, Robson earned Wisconsin Fastpitch Softball Coaches Association all-state honors thanks to her rare combination of power, hitting for average, speed and pitching. Robson just returned from a dream sabbatical in Europe, where she was selected to play for Great Britain’s national softball team. Robson’s father is originally from Great Britain, so she has dual citizenship. It was a senior season for the record books, as Robson hit .598 (second-best in area) with three homers, 34 RBIs, 12 doubles and four triples, along with a .645 on-base and .951 slugging percentage. On the mound, Robson struck out 174 in 107 innings, compiling a ridiculous 0.72 ERA while not allowing a single run in Metro Classic play. She went 17-4 and led the Toppers to an undefeated conference record and league title. Robson was named first team all-district and all-county. Head coach Bill Greskiw, a softball nut for 23 years, said Robson is an all-time great. This slap-hitting left-handed batter was automatic when it came to getting on base. Her lightning speed made her a threat on the bases as well as in center field, where she could run down any shot to the gap. A first team all-Racine County outfielder, Schmalfeldt hit .414 for the season, raising her average 180 points from last year, but took off in the state tournament. She hit at a .558 clip and boasted a perfect 1.000 fielding percentage in three state games (2-1) with five assists. Most notably, Schmalfeldt was a stunning 4-for-4 in a state semifinal victory over Slinger, a game that began after 10 p.m. and didn’t conclude until early Saturday morning. Jenna also earned second team all-Southern Lakes. Schmalfeldt, along with her cousin Ashley, the team’s best power hitter and third baseman, was one of seven senior leaders and a consistent reason the Demons scored runs throughout the lineup. “It was fun watching Jenna grow as a softball player and a person. We will miss her smile and love for the game,” Caliva said in a Journal Times article. Kayla Kerkman, a Westosha Central senior, was named top senior infielder/catcher after her final season (Earlene Frederick/The Report). Kerkman, a left-handed slap hitter, was the heart and soul of the Westosha Central softball team. She compiled career highs in multiple categories, including stolen bases with 23, a school record, which was a major leap from her junior season where she had six. The senior shortstop, who was named the state’s top senior infielder/pitcher by WisSports.net, was also one of the last links to the Falcons’ state championship teams of year’s past. Kerkman earned honorable mention all-state honors, as well as first team all-SLC. Kerkman hit .459, scored 42 runs and knocked in 16 runs. Also, Kerkman was in the state’s top five with 51 hits. Kerkman was first team all-district and WFSCA All-Academic. She broke the school record for singles in a season. “Kayla was the leader of the infield and the spark plug for our offense,” said head coach Tom Lampe. Kerkman will play softball at Winona State University. Schumacher is still undecided on where she wants to play college softball, but if she improves on her 2018 campaign the offers should roll in soon. Schumacher was named second team all-state among large schools by the WFSCA, an impressive feat considering Whitewater is smaller than all Division 1 schools. The catcher belted her way to a .551 batting average with 29 RBIs, 24 runs scored and 13 doubles. Schumacher also earned first team all-district and Janesville Gazette All-Area accolades. Sometimes, overall stats don’t define a player. While all other publications and postseason awards teams shut out Burlington’s starting third baseman, we can’t ignore perhaps the most clutch hitter from the state runner-up Demons. Though her average was .295 for the season, Schmalfeldt banged five home runs and 21 RBIs. In the state tournament, she got better, hitting .333 with a key home run and five RBIs. Schmalfeldt is on the first team based on her power hitting, vacuum-like glove in the field, strong arm and clutch performance. It started in the sectional semifinal, with her team down five runs and down to the last three outs of the season. Schmalfeldt geared up and blasted a three-run home run over the fence to save the season and shock upset-minded Elkhorn in an eight-inning stunner. The next game, Schmalfeldt provided a key RBI double late in the game to help preserve a 6-4 sectional title win. Then, she blasted another three-run shot to set the tone in the first inning of the Demons’ state quarterfinal victory. A sure-handed fielder, Ashley struck fear in opposing pitchers and made them pay with long bombs at the most opportune times. All you need to know about this multi-sport athlete is the fact that she made two game-saving catches in right field in a span of one week. First, she blocked a blinding sun in the seventh inning of the Demons’ sectional final victory, when the Falcons were threatening, and saved a run with a shoestring catch. Then, in the state semifinal victory over Slinger, the Owls were mounting a potential comeback late when Berezowitz drifted back to the fence for a magnificent running, snow-cone catch. Berezowitz, a state champion in 2017 with the Burlington volleyball team, hit .558 in three state tournament games. She hit .413 for the season and earned first team all-county and second team all-conference. Maddie, a left-handed hitter, batted second and often set the table for the big inning. She showed plus speed and strong plate discipline. Berezowitz was excellent at moving runners with 12 sacrifice bunts. Berezowitz has already committed to play college volleyball at the University of Kentucky in 2019. The left-handed junior first baseman/outfielder was named first team all-state by the Wisconsin Fastpitch Softball Coaches Association. She collected 43 hits and belted six home runs with a .494 batting average along with 40 RBIs. She was also first team all-district and all-conference. A second sophomore on the first team, Remington had a breakthrough season. She earned honorable mention all-state and first team all-SLC after batting .512 and .543 in SLC play to lead the league. The all-district first teamer and Janesville Gazette all-area selection smacked 41 hits, including nine triples and eight doubles. Remington helped the Elks score an upset in a regional final victory and nearly knock off host Burlington at sectionals. 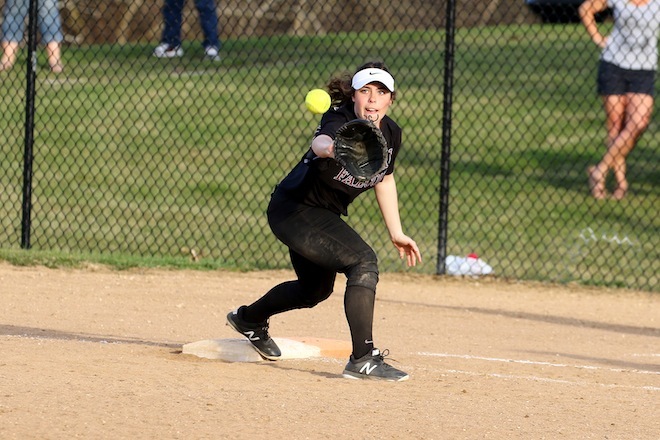 The Panthers’ left-handed ace pitched in a 25-strikeout sectional semifinal thriller against rival Westosha Central, where the Panthers came up just short in a 2-1 loss but Zerr made her mark as one of the area’s elite pitchers with double-digit strikeouts. She earned Kenosha County’s only win over state runner-up Burlington, a game at BHS where Zerr dominated for most of the contest. Zerr finished the season 9-3 with a 2.24 ERA and 94 strikeouts in 84-1/3 innings. Also a first baseman, Zerr raked at the plate, hitting .500 with 15 RBIs, nine doubles, a .671 slugging percentage and a remarkable .990 fielding percentage. “Madi worked very hard in the offseason to improve her pitching and her hitting, which was evident,” coach Jenny Jacobson said. The heart and soul of the Comets, the younger sister of former Delavan superstar Jennah Speth made first team because she put together one of the best playoff runs in area history. She began the Division 2 playoffs with an upset victory over higher-seeded Pewaukee, a 4-1, 12-inning marathon where Speth struck out a whopping 18 batters. Then, she struck out eight and 11 in two more victories before sitting down nine in a 2-1 sectional final loss. She allowed only five runs in four playoff games (3-1). For the season, Jaida went 7-15 with a 2.15 ERA and hit .351. “At the end of the year, she was one of the best pitchers in the state,” said Delavan coach Hank Johnson. The University of Dubuque commit was the Panthers’ team captain and boasted the highest batting average in the area (.629). A four-year starter at catcher, Jrolf was first team all-Trailways Conference and batted cleanup. She had the highest batting average in the conference at .659. Jrolf smashed 39 hits, scored 29 runs and added nine doubles, two triples, nine stolen bases and 21 RBIs. After missing the first third of the season, Gosh returned with a vengeance in helping the Elks nearly advance to state. A second team all-area pick in 2017 after hitting nearly .500, Gosh saved her best for the postseason run. She went 3-for-4 against Burlington in the sectional semifinal, a game the Elks could’ve easily won after leading 6-1 in the seventh. Gosh smacked a double in Elkhorn’s 7-6, nine-inning upset regional final win at Fort Atkinson, and she hit around .500 during the last few weeks of the season. With a full season, Gosh would’ve easily flirted with a first team selection. One of the area’s better hitters, Gosh has a bright future. The fleet-footed center fielder showed tremendous range in the outfield, and kept the Panthers in most games decided by 2 or 3 runs. She was the team catalyst in the leadoff spot. Lamberson earned first team all-SLC and all-district honorable mention thanks to a .377 batting average, 13 RBIs, 20 runs, six stolen bases and a .461 on-base clip. Defensively, Lamberson posted an impossible 1.000 fielding percentage. One of the most effective pitchers in the area thanks to her velocity and ability to fool batters with movement, Kazamura was second team all-SLC and lit it up in a sectional semifinal win over rival Wilmot with double-digit strikeouts. She was 15-4 with a stunning 1.82 ERA. Kazamura fanned 146 batters in only 111-2/3 innings. At the plate, Olivia hit .329. “For a three-week stretch, she was as unhittable as anyone,” Lampe said. It was a breakout campaign for the slugging junior, who was honorable mention all-SLC thanks to a .392 batting average and 29 RBIs. Like some of Burlington’s best, she saved a little something extra for state, when she hit .417, including the team’s lone RBI in the state title game. A second team all-SLN pick for the second straight season, Stefanczyk helped the Panthers cruise to a 14-8 record before losing 3-2 in a regional final. A senior team captain, Stefanczyk was a four-year starter at shortstop and will play college softball for Milwaukee School of Engineering. Also an All-Area basketball star in 2018, Stefanczyk hit .531 and featured an impressive .615 on-base percentage. She wrapped 34 hits in 23 games, scored 29 runs, smashed four homers and snagged 19 stolen bases. Lauren didn’t commit an error and wasn’t afraid to sacrifice her body to get an out. With star pitcher Robson graduated, Paleka embraces the role as “the woman” for next year’s club, as she’ll take over main pitching duties. This past spring, however, Paleka already began making her mark as a budding talent. She earned second team all-state, first team all-county and first team all-district for her stellar hitting and pitching. Paleka rocked a .513 batting average with an .833 slugging total, including 40 hits, eight doubles, seven triples, two home runs, 44 runs and 16 RBIs. She also stole 16 of 16 bases. On the mound, Paleka went 3-1 in 40 innings with a 0.71 ERA. She struck out 53 batters. The Lady Wolverines’ team MVP, Fiehweg was the brightest spot in a tough, losing season for the young Waterford girls. “Everyone wants her on their team,” said Waterford coach Ryan Krueger. A clutch hitter and strong all-around player, Fiehweg hit .410 from the leadoff spot with 17 RBIs. Fiehweg crushed 12 extra-base hits and earned second team all-SLC. A rare combination of power and speed, Brodhagen used to bat leadoff before converting to a power spot. The result was nine home runs and a batting average in the .350 range. Brodhagen went to state in the spring for discus, all while playing for the Indians softball team. A second team all-Classic 8 performer, Brodhagen hit a walk-off home run late in the season, then followed it up with a home run in the team’s lone playoff game. A second team all-SLC selection, Edquist hit .301 from the catcher position and ripped six home runs and 32 RBIs. With a booming 1.007 OPS, Edquist was all-district honorable mention and a Senior All Star. Edquist broke the school record with 12 doubles in 2018. The winning pitcher of the game in which the Lady Wolverines upset Wilmot and changed the course of the SLC, Baker was named first team all-Racine County. Baker was also first team all-SLC thanks to a .507 batting average and 16 RBIs. She also posted an .871 fielding percentage in the infield. The infielder with sure hands and a dazzling glove had an .873 fielding percentage and earned first team all-SLC honors. Platts will play softball at Madison College this fall and major in English. For the season, she hit .395 with nine doubles, two homers and a .592 slugging percentage. The only freshman on this year’s All-Area team, this tall, athletic infielder and lights-out pitcher is going to challenge for player of the year, possibly even next year. A natural ball-player, Wischnowski can absolutely fire straight gas on the mound. She batted .585, the third-best mark in the area, and added 16 RBIs and a .950 fielding percentage. On the mound, Wischnowski was a staggering 8-1 with three shutouts, a 1.93 ERA and only eight walks in 61-2/3 innings. “She was our best offensive player as well as our No. 1 catcher,” Badger coach Glen York said. .345 BA, “defensively, top 3 in my 13 years,” Purney said.